Well that was a surprise. When I went to bed last midnight the news reported more indications for a remain vote than for a leave. Even with psephologists cautioning that the referendum is very hard to predict due to the lack of comparision data from earlier votes, it seemed to me that the outcome was likely pro EU. While I had personally wished the Brits to stay in the Union they took a democratic decision and now the politicans have to act upon it to execute divorce. Awakening to the new reality I now have to assess what this means for my personal p2p investment strategy – as a foreign investor. Only a small portion of my p2p investment portfolio is invested in UK platforms (a substantial amount at Saving Stream, small amounts with Ablrate, MoneyThing and Rebuilding Society). The markets are in turmoil, and I have already taken the hit by the pound dropping sharply compared to the Euro this night. 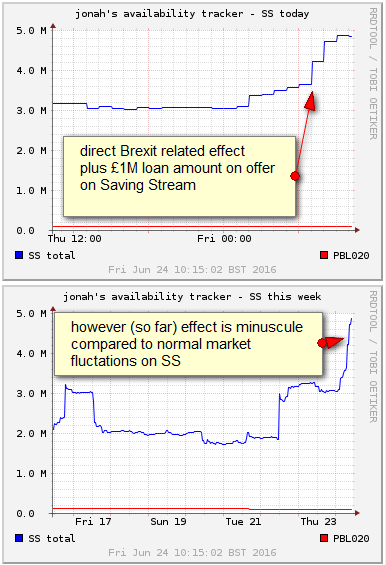 Another effect is that the uncertainty is causing more investors to put up loan parts for sale – the effect is measureable on Saving Stream and currently accounts for a plus of approx. 1M GBP loans on offer there. Still this amount is very small compared to fluctations of liquidity levels due to other factors. For most loans this now means that there is a considerable delay in selling loans, due to queue size. However this could be cleared up quickly by one or two large loans repaying and the interest payout on July 1st. With Saving Stream and Moneything loans will depend highly on the development of the property prices. Some expect a drop in property prices. I think it is to early to tell if that will happen, but I think it is very likely that there will be slow down in new development activity while everbody waits to see what the outcome will be. This will affect the demand for bridging loans and thereby Saving Stream and Moneything to a cetain degree. And then totally unpredictable there is the question how this new direction will effect the European economy as a whole and whether it might trigger a recession. While I am optimistic that it will not, there is an extreme amount of uncertainty and I have to consider that this might impact my p2p investments on continental European platforms. For now I have decided that I will not deposit new funds on UK platforms (which I was planning to do) but will not withdraw funds either at the moment and will just keep reinvesting the proceeds. I see little point in selling off loans (would be hard right now anyhow as liquidity seems to dry off temporarily), and exchange the amounts back to Euro. That would guard me from further drops of the pound exchange rate, but I think it is not sure that the pound will fall into a continuing decline (even so that seems more likely than any rise in the pound rate vs the Euro). For the continental platforms my strategy remains unchanged by the event, even though I think that the risks on some platforms have risen somewhat too in the mid-term outlook. Do you have a comment on which platforms you are investing in currently? And your strategy. Still happy with mintos? I was lucky enough to quit GBP investments (I only had Saving Stream) well in advance due to Brexit risks and keep EUR investments only. It was a good move, GBP depreciated a lot afterwards. Moreover, I don’t want to add an increased currency risks on top on the other risks which P2P has, and want to avoid possible increased tax declaration complexity in dealing outside EU investments (when it will become effective). Sorry for all those P2P European companies which did that (soon useless) UK FCA licenses. I’ve been investing for 20 years and never tried to invest directly in currencies. Investing in other asset classes (e.g. P2P lending) that are denominated in foreign currencies is a bit different though, since you’re not looking for a return solely by guessing the currency movement right. The best research I’ve seen on investment returns in foreign-denominated shares and bonds (by the excellent professers Dimson, Marsh and Staunton of the London Business School, who produce the Credit Suisse Global Returns Yearbooks and Sourcebooks) has shown that over time you can generally expect currency fluctuations to even out if you invest in many currencies, although the market can wrong-foot you for many years before correcting – and that’s assuming you guessed correctly in the first place. While spreading your money across more geographies can lower your risks, there’s no question that investments in foreign currencies adds to your risks, so it certainly makes sense to factor that in when deciding how much to invest in another individual currency.